According to Neil Sedaka July is a 'like a fire cracker all aglow' (Calendar Girl). This is a good description to start my July end of month review. There is a lot of pink in the garden at the moment. A surprising amount of pink actually, I would not have said I was a pink gardener, but apparently I am. In the foreground one of my all time favourite David Austin roses, the Portmeirion rose. Bet you are all surprised at that! It is such a good performer. It is one of the first to start flowering every year and is now bulking up to be a really good plant. Some of the colour combinations should not really work, but these cosmos, shasta daisies, Californian poppies and the aster work together brilliantly in my world. Really pleased with how this looks. and let's hear it for the Echinacea Purpura. I have lots of this, all grown from seed a few years ago. Here it is with a Stipa Gigantica also grown from seed and a rather pink dahlia. Yes, pink is doing well at the moment. But life is not all pink. The Crocosmia Lucifer shoots red fire into the garden. The sunflowers are doing their job and attracting lots of bees. and I have a new love this year, zinnias. So easy to grow and so beautiful. I will be growing lots more of these next year. In the veg garden the broccoli is coming on well. I can grow broccoli to this stage really well, I have failed to ever harvest any. Will this year be different......? Onions, garlic and potatoes are now largely harvested. I think I might have harvested the onions a little too soon for some of them. But I am pleased with the crop I have and it is a much more successful crop than last year. Better watering and weeding on my part has really paid off. Where there was space I have planted out my wallflower seedlings. I have lots, no really, lots. I might have too many but we will see. The cooking apple tree, (think they are Bramleys) is laden down as usual. It is an old tree and huge, but it crops like crazy every year. Soon it will be time for apple crumble, apple sauce, apple and sultana cake and a variety of jam bases. It is without doubt a splendid tree. The eating apple tree (no idea what it is) is also heavily laden for the first time in about three years. This is great except I don't eat raw fruit so I will be giving away most of these that I can. It is a lovely tree, but quite frankly of little interest to me. Except that the birds love the windfalls. I tend to let them lie and watch as they are slowly pecked away. Also the local foxes come and take them. I love watching them pick them up and wander off to eat them. My Medlar 'Nottingham' tree is doing very well this year. Now in its third year it has put on a real growth spurt. Last year I made Medlar jelly for the first time, it is amazing. The colour is a beautiful dusky ruby red and it tastes wonderful with meat. The meadow area is coming on well, though getting now to be a little past its best. The plug wild flowers I bought a couple of years ago are now really coming on. I just need more of them. I hesitate a little before putting this photograph up as I know that some will totally disapprove of my methods. This is not an alien landing strip but the marked out areas for my prairie planting. I confess I have glyphosated the grass. It might not be the best or most environmentally thing to do in the world I admit, but I can clearly see the shape I need to dig over. I will start digging this over soon so that the frosts over the winter will break the soil down nicely. It also removes the many many lawn weeds that will be a menace to deal with if I don't deal with them harshly at this stage. 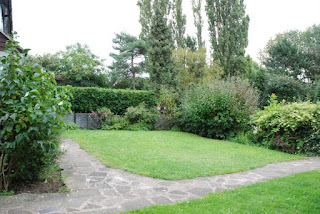 I would prefer to do it in a more garden-friendly way and I am not a regular or routine user of chemicals at all, I am happy to listen to effective and efficient alternative methods I could use. I am growing a few varieties of grass from seed, some echinops, echinacea and sanguisorbas all ready to go in next spring. I am also collecting as many self-sown Stipa Tenuissima that I can and potting them on ready to populate the area. It is a big project and one that I will blog about separately as it progresses. Its the first major project I have undertaken in the garden since completing the pond and I am very excited about it. For those of you who think that all looks great and all is well I have to show you this. This is Geoffrey lying on a Stipa Tenuissima. The cats have laid (quite literally) this patch bare. I blink for a minute and Chesney has replaced Geoffrey. Chesney likes attacking grass. Thanks Chesney. The pond remains really low. Despite some rain it is probably as low as I have ever seen it. I finish on this image of cosmos peeping through my garden bench. The cosmos have been wonderful this year and as ever I think I should have grown more. 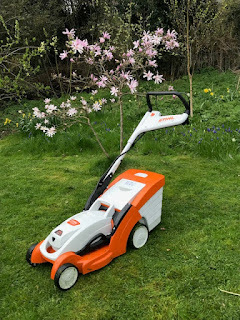 Big thanks as ever to Helen and her blog the Patient Gardener for hosting the End of Month Review. Your garden looks great to me, even the pond is good despite being low. I too love Cosmos and save seeds at the end of Summer for next year's crop. Thanks Bridget, I usually get a few self-sown cosmos but I really should get my act together and save the seed, it would save me some cash! Thanks for joining in again this month. I am know worried about my PSB, I thought they were pretty straight forward, though I haven't grown them before. Great to see all your achieving! Re use of glyphosate each to own I say. Mr Sedaka has a way with words and those indeed seem most apt for July. Enjoyed your end of month post Alison and looking forward to reading more about your progress with the prairie planting.